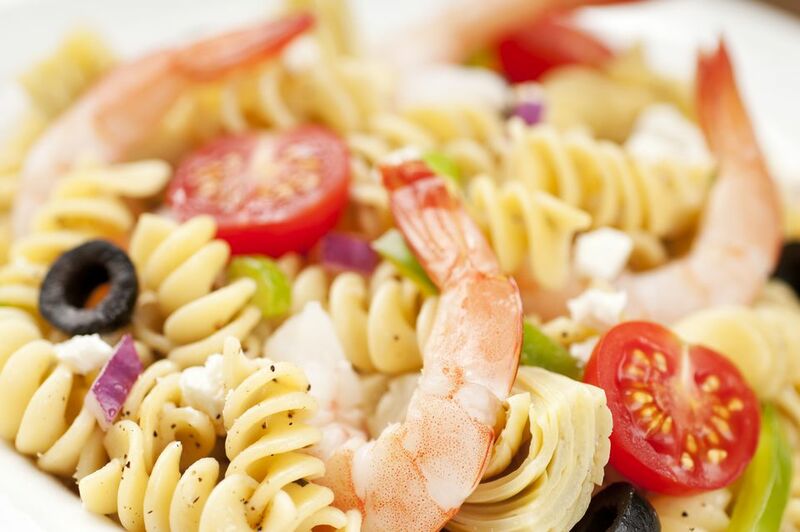 This pasta salad may be made with crabmeat, shrimp, lobster, or a combination of shellfish. Canned shrimp and/or imitation crabmeat work well. Cook pasta until done but not overcooked. Cool under cold running water; drain well. In ​a large bowl, combine all ingredients except tomatoes and Parmesan cheese. Toss gently but blend thoroughly. Refrigerate the salad for 3 to 4 hours. If the texture is dry add more dressing, top with tomatoes and parmesan cheese. This is a creamy pasta salad, but we prefer this to the ones with oily dressings. You can also substitute small frozen shrimp. Be sure the shrimp are thawed and well drained on paper towels or the salad will be watery.